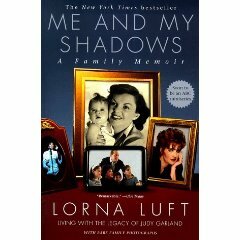 Me And My Shadows is a family biography about Judy Garland , written by her daughter Lorna Luft . I have always been a huge fan of The Wizard of Oz , so needless to say, this book has cult-classic status to me and was a must-read! The first half of Me And My Shadows details Lorna 's childhood and her responsibilities as far as dealing with and taking care of Judy Garland . The book really sheds light and puts to rest many rumors around Judy Garland 's addictions, behavior, and personality. The second half of Me And My Shadows is about Lorna 's rise to adulthood after her mother's death, and her rise to stardom while having to bear her mother's fame shadowing over her. As with any biography, I like how open Lorna is, especially her educated reactions to drug addiction and alcoholism. I wish the book had been written in later years to gain a better perspective on the events around Liza Minnelli and the Luft family since then. It was hard for me to put this book down, as I have always been genuinely interested in Judy Garland and her legacy. Me and My Shadows is a great read, even being 12 years out of date!